But Tales from the Inner City is definitely my favorite work of his so far. Each story focuses on a different animal, real or imagined for the book, and their effect on or absence from Tan’s surreal urban landscape. There are the ghosts of horses running through crowded city bridges. There are bears suing humans for past abuse and damage…and winning. There are fish that live in the sky. There’s a unimaginably huge swarm of butterflies that bring inexpressible joy to the city, for a brief moment. And all of this is beautiful and beautifully told. All of this would be gorgeous writing all on it’s own, combined with Tan’s always wonderful and evocative artwork. But at the heart of this book is a point about what we as humans do the environment and fellow animals around us: how we disappear them, how we treat them as nothing but objects. How we forget that we are animals, too, to our detriment and, most importantly, to the detriment of the world at large. 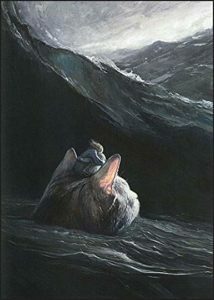 This book is begging is to remember the animals and to respect them, to care about what happens to them, before it’s too late. It’s bittersweet and heartbreaking to read, but entirely worth the heartbreak. This is a book that looks like a coffee table book, but is something very important in disguise. Lend this to all your friends who rail on about the environment. Lend this to ones who don’t, but really should. Years ago a friend bought me The Red Tree as a gift and I’ve loved it ever since. 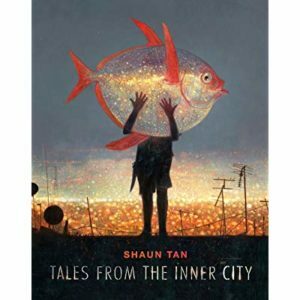 Thanks for this review—good reminder to seek out more by Shaun Tan!